Installing a ceiling fan in your home is not complicated. If you're putting it in a room where you already have a central overhead lighting source, it is simple. Hook into the existing electrical supply and mount the ceiling fan to the wall. 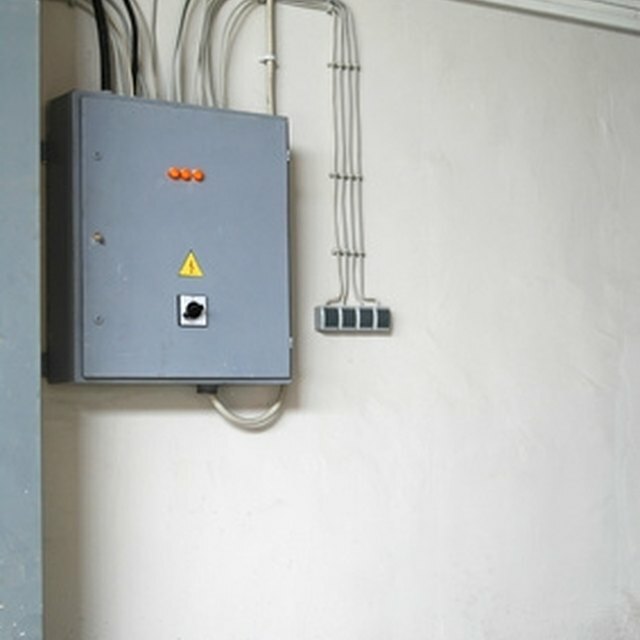 Ensuring that you have the right-sized circuit breaker helps you avoid electrical meltdowns. Circuit breakers prevent electrical overloads. Circuit breakers come in two major sizes. The 220-volt circuit breaker is commonly used for heavy-duty appliances, such as gas stoves, furnaces and central air conditioning units. These breakers are not needed for a ceiling fan. Ceiling fans are in the category of lights and electrical outlets, which require a 110-volt outlet. Circuit breakers are designed to switch off when electrical current exceeds a limit the breaker cannot handle. Ceiling fans only require 110 volts to properly run. The smaller circuit breaker is often called a single-pole circuit breaker. The single-pole breaker protects one wire instead of two and generally carries 15 or 20 amps. Single-pole breakers are anywhere from one-half to 1 inch wide. Some of these circuit breakers come in tandem with one another and have two operating switches instead of just one. If you are unsure of your current circuit’s ability of to run a ceiling fan, start by checking the ceiling fan’s amperage. A circuit can only handle about 80 percent of its total capacity, according to the Home Depot Buying Guide. This means that a 15-amp circuit can handle up to about 12 amps, while a 20-amp circuit handles up to 16 amps. If you replace the fan’s circuit breaker, buy a circuit breaker that is the same brand as was the previous breaker. The Home Depot notes that it is dangerous to use different brands of circuit breakers side by side in your breaker box. Most circuit breaker brands can still be purchased, so even if you have to replace an old breaker, find the brand you need. What Is an AC Capacitor? What Is a Hard Start Capacitor? How Does a Fuse Panel Work?